With the new version of Social Bluebook, creators have the chance to be proactive. After you and a brand make a connection and decide to work with one another, you can send a professional proposal with your ideas on how you want to promote their content. What sort of content should you write in a proposal? In this article we go over each field, what they mean, and the best practices for getting an advertiser’s attention. What is your proposal about? Here you want to give the advertiser a general idea of what you are going to do. In a short paragraph, explain what you are going to do on your platforms. Keep it high level; the precise details you explain later under deliverables. After you explain in a high level your plans, you have the further option, if you think it’s necessary, to emphasize how well your platforms will work with the brand with examples of your audience demographics or similar past content. The platforms you select here are the ones you want to post on for this project. If you want more than one upload (deliverable) on a platform, click on the icon to add another upload for that platform. 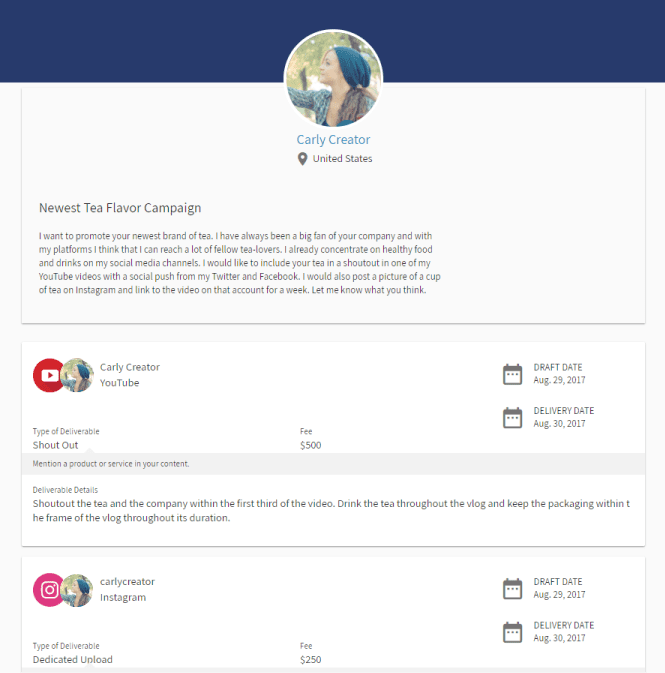 Inside each deliverable box are a few fields to enter in the details of each upload you propose to make for the campaign. Add your username or URL: Include the username or URL of your platform that will host the branded content. Type of deliverable: You can select the type of upload the content will be. Read more for breakdown on types of deliverables. 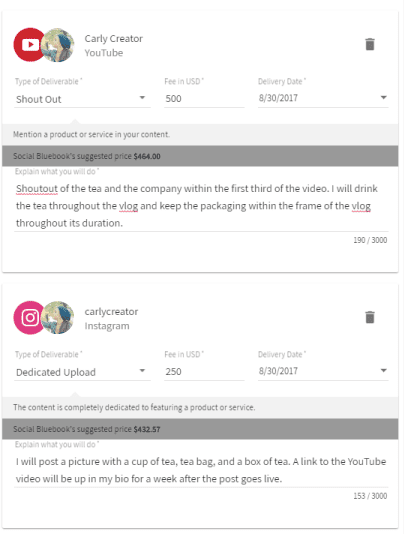 Fee: This is the amount you want to be paid for producing and uploading the content. Upload date: This is the date the content goes live on your platform. Explain what you will do: In this section you go into the details of the upload. Explain the content, and if relevant, specify the length of the content. Other – Name of the platform: If you select the ‘Other’ platform as an option, in its deliverables box you will need to specify which platform this other platform represents. The expiration date is the date the proposal to the advertiser expires. It is a good idea to give the advertiser plenty of time to respond, but an expiration date can be useful if your proposal idea is time-limited (such as a seasonal promotion) or if you only have a limited amount of time until you begin other projects. You can set a longer date if you do not have a particular time limit for your proposal. Advertisers like to approve content before you upload it for them. This field gives you and the advertiser how many numbers of days they can expect to see a draft of the deliverable uploads before they are made live on your platforms. Be sure to give yourself enough time to make any necessary edits if the advertiser desires a couple changes. If you have any further questions about writing a proposal, check out our FAQ, leave a comment below, or contact us at support@socialbluebook.com. Auch wenn ich nur ein Kleiner Künstler bin, so fühle ich mich sehr Willkommen. Danke Social Bluebook Team. Wir hier bei Sozialen Bluebook nicht glauben, es gibt keine “kleinen Künstler”, aber gerade Künstler, die noch nicht ihr volles Potenzial erreicht, und das ist unser oberstes Ziel, allen Künstlern zu helfen, ihr volles Potenzial zu erreichen! I am very interested in advertising products and I guarantee a full review , honesty, and publishing on the time required. I am very loyal and you have my word. Thank you and hopefully we can get this into action. Thanks for your Loyal support and belief in our mission Emilie. We will never cease in our pursuit of empowering the Social Content Creator to reach their highest potential! How do I find out who’s the brand? Generally speaking, advertisers look for platforms with 5,000 followers and greater. While there are exceptions and some advertisers will work with smaller creators, 5,000 followers minimum for the main platform is generally expected. Focus on growing your platform with new original content to continuously grow your audience to attract more advertisers. Determine the genre of your content. Genres include lifestyle, family, travel, games, fashion, and so on. Identify small to medium-sized brands with products and services that fit the genres of your content that you would like to promote. Go to their website and look to see if they have an influencer marketing or ambassador program. If they do and you fit their requirements, reach out to them to express your interest. If they do not, reach out to their marketing team or general information team to see if they are interested in working with you. Send them a link to your profile to show them your platforms and content. I think Lei Boucher’s comment meant that there is no list of Brands as an example. I have been clicking all around the Social Bluebook website (even checked out the Youtube page) to get a feel of what Brands are used. There are no lists or explanations as to why you guys keep the Brands a secret. If it is because we have the opportunity to pick whichever Brand we’d like to work with, that is not clarified in any part of this website. Regarding how you calculate the average view per video, is it an average for all the videos I’ve ever put on my channel from day 1? or is it the last month, or last year? And what about videos I have not released? I often upload videos for other purposes that do not get published, for instance as a “proof” or approval video for my clients to view before I send them the high res file for let’s say an Amazon video they contract from me.